Originally published over on the ShapeShift blog. The latest crypto winter is upon us, and today ShapeShift felt the bitter frost. Today, we let 37 employees go, reducing the size of our team by a third. It’s a deep and painful reduction, mirrored across many crypto companies in this latest bear market cycle. Crypto, like the moon we strive toward, is a harsh mistress. We ride high and fast during the ascents, growing at rates unseen almost anywhere else in the business world (ShapeShift grew 3,000% in 2017). And when the markets turn, the crypto recession is similarly dramatic and severe. Booms and busts are intrinsic to any frontier. And while comfort out here is elusive, passion and opportunity are abundant. Regardless, separating so many from our team is painful. To those valued individuals who stepped off our ship today: I am sorry this happened. Your confusion, your sadness, your anger… all of it is understandable, and I am sorry to put you through it. Your contributions — of effort, of personality, of experience — remain part of our fabric. Though it has ended, we are improved by our time with you, and I hope you find yourselves improved by your time with us. And to our loyal customers, to the industry, and to the incredible individuals and teams that continue to persevere through this winter with us: I’d like to reflect on the lessons learned, and provide a glimpse of the future toward which we’re building. As a company, we’ve made a thousand mistakes. The most thematic has been a lack of focus. Years ago, we saw ShapeShift as a simple tool. As a result, we naturally built other tools that would be useful in tangential ways. These turned into a family of crypto brands and services. We built CoinCap for live crypto market data. We saw opportunity in non-custodial portfolio management systems using Ethereum smart-contracts, which led us down the path of developing a project capitalizing on that technology. We acquired the hardware wallet company, KeepKey. We’ve worked on some projects still under development, as well as plugins and APIs. 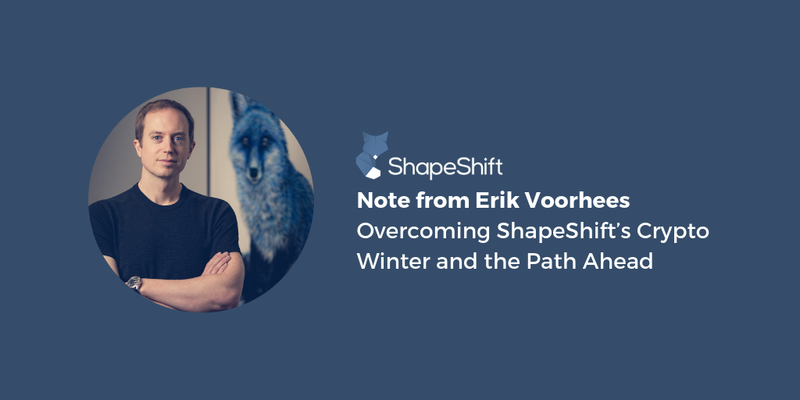 And it was not only the ShapeShift product that was in part neglected, but our own organization: the people, and structure, and communication within our company. Our commitment to “People Building” was insufficient. Yet, despite these missteps, the profound and intense bull market of 2017 hid the lessons from our view. Everything was going well. Hundred percent growth every month has a way of obfuscating reality. We had people and structural issues. We’d grown too fast, given our (in)experience as leaders. By the time we learned how to manage a 10-person team, we were 30. By the time we learned how to manage 30, we were 80. Then 100. Then 125. Our understanding of how to organize people grew, but not as fast as the people. We had legal issues. Our own growth coupled with that of the industry meant increasing scrutiny. The grey area within which we were once comfortable was feeling less so. So we started exploring every nuance of complex financial services regulation. As we stepped into this mire, immense legal bills and risk assessment forced resources to be diverted away from important parts of the company. We had customer issues. Business was declining from both aggregate market recession and increased competition. Our imposition of KYC’d accounts, themselves the result of trying to be cautious in a challenging regulatory environment, caused many of our most valuable API partners to leave us for competitors who have not perceived regulatory risks in the same way. We expected it, but still, it stung both financially and psychologically. We had financial issues. Our balance sheet returned to Earth as asset prices were falling. We were partially hedged, and while we were not naive to the risks, by the early December drop, it dictated material course correction. To that end, it is the confluence of these issues combined with our own lack of product focus that resulted in today’s layoff. 2018 marked a rough year. While this new one starts upon some painful reorganization, we’re encouraged and hopeful for 2019. As I have noted, ShapeShift began as a simple tool to convert one digital asset into another. When I started it in 2014, it was in the aftermath of the Mt. Gox implosion and countless other exchange and wallet hacks. It seemed people were inextricably drawn to placing trust with 3rd party entities because it was a little easier. People tend to accept great risk in return for convenience (myself included — indeed, who among us doesn’t leave crypto on exchanges a little longer than we should?). I suspect a great many cryptocurrency customers have never held their funds anywhere other than a centralized exchange. This ongoing custodial risk is tragic, and we plan to fix it. The lesson of “controlling your own keys” must remain a core principle in our industry. This doesn’t mean everyone must do it at all times, or that there is no place for custodial services. It means simply that people should understand the risks and know how to avoid or minimize them. They should be proficient in basic financial sovereignty. Unfortunately, the need to place trust in others for one’s own financial security is a deep cultural norm. It is on all of us to help unwind that habit. Among its many virtues, crypto assets enable people (and machines) to store value easily themselves and to transfer value directly to someone else, anywhere on Earth. This power is awesome and unprecedented. Furthermore, regardless of race, ethnicity, religion, gender, socio-economic status, geography, or ideology, all individuals can connect with each other with this tool of direct economic interaction. It is beautifully inclusive and empowering. My hope — and goal is — that financial sovereignty becomes a pillar of 21st-century civilization, one of its most important advancements. And just as this non-custodial principle inspired ShapeShift’s genesis, it now inspires our rebirth. Through this difficult year, with a new sense of focus, we’ve been weaving the new ShapeShift into existence. It is our tribute to the power of digital asset technology, and our contribution to self-sovereign finance. We don’t want to overstate with grandiose promises, we’ll simply invite people to try it out in the near future. We’re all on a journey of growth: myself as an individual, ShapeShift the company and its dedicated, talented employees with whom I’m so privileged to work, and crypto as a community. May we find the strength and discipline to struggle through every obstacle toward victory; toward a world of borderless, apolitical finance for all humans. We wish our departing foxes good fortune and good grace. For any questions or media requests, please email emily@shapeshift.io.